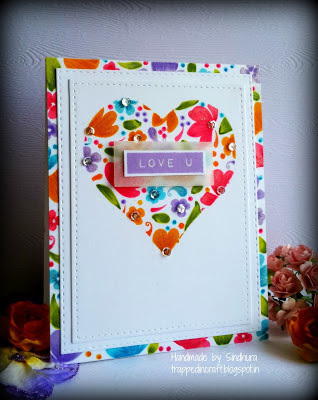 Paru's Card Making Challenges: March challenge winners!! Absolutely love the colorful flowers and the stunning masking!! Just love Ria's colorful flowers! And I always love them peeking our from behind a white strip! Congratulations to the winners and a BIG Thank You to all of you who stopped by to play! I am truly overwhelmed by your response! Hope to see you back here on the 1st of April when I post my next challenge! Hi Paru! Your card is fabulous. I love the floral design and your artowrk is amazing as always. If you enjoy playing along in challenges, I sure would be honored to have you stop by and join in our FUN challenges at Word Art Wednesday. Our challenges are always Anything Goes, and we have awesome prizes too. I hope you will stop by to join us. WOW!! I'm thrilled to see my card featured here! Thanks so much!